With postmark from office of purchase. 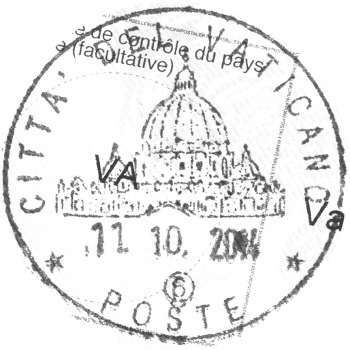 It was purchased on 13 October 2014, however the postmark was 11 October 2014. Perhaps the clerk has forgotten to change the slug. The Czech Republic has won the UPU's competition to design a new international reply coupon (IRC), beating 13 or countries. The work of Czech artist and graphic designer Michal Sindelar will display the theme "Water for Life", chosen to reflect the 2013 UN International Year of Water Cooperation. The new "Water for Life" IRC will go on sale on 1 July 2013. Postal customers will be able to exchange it until the end of 2017. It will replace the current coupon, known as the Nairobi model, which was first issued on 1 July 2009 and will remain valid until 31 December 2013. When one writes to a stranger and requests a reply, it is considered polite to enclose a self-addressed stamped envelope. 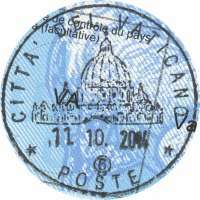 This works well when both persons live in the same country; however, if they are from different countries, the enclosed postage stamp will not be valid. This technical problem was solved in 1906 when the Universal Postal Union, during its Congress in Rome, introduced the International Reply Coupon service. As the service began before the days of airmail, the earliest coupons could only be redeemed for a single-rate ordinary postage stamp to a foreign country. 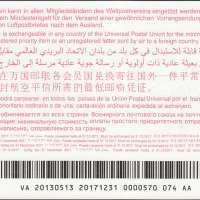 In terms of today's UPU Convention, International reply coupons (IRC) are exchangeable in all member countries for the minimum postage of a priority item or an unregistered airmail letter sent to a foreign country. The UPU's International Bureau processes several million coupons each year and deals with of all accounting aspects. The International Bureau does not sell IRCs directly to customers; they must buy them from their local post office. 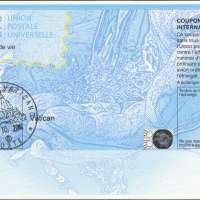 Although Posts are not obliged to sell IRCs, it is mandatory for Posts to exchange the coupons. If a Post does not sell IRCs, it is possible to purchase them in a post office located in a neighbouring country.